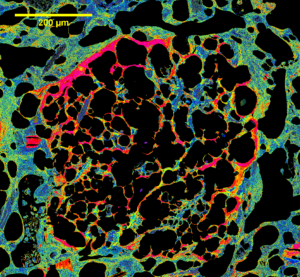 Coke Petrography | Pearson Coal Petrography - We fingerprint your coals, coke and carbons. 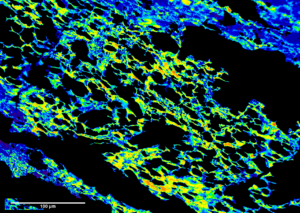 Until recently, few options were available to untangle the optical secrets of metallurgical coke, which is characterized by a wide range of reflectance and unique textures. 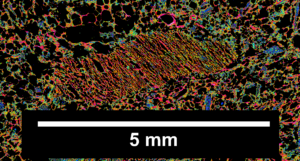 Now, aided by robotic microscopy, a bireflectance-imaging technique, gigabytes of pixel data and ImageJ, metallurgical coke petrography has been transformed, and with a kaleidoscope of colours and endless Inertinite shapes, we explain the history of a coke. Cokes prepared from different ranks of coal are distinguishable from one another by the bireflectance of the melted vitrinites (Romax – Romin), and by AQ, or Anisotropy Quotient, which is Bireflectance/Maximum Reflectance*10. Both are LUT colour-coded for emphasis. 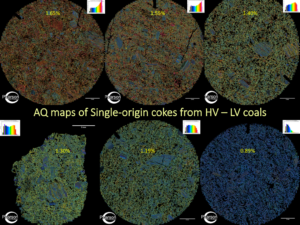 Six examples of single-origin cokes are shown as Coke Mosaic Density maps (Image 1), made from parent coals with Romax reflectances of 0.89% to 1.65%, or High-Vol to Low-Vol coal rank. 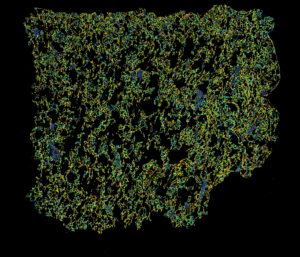 The increasing anisotropy of the samples in the image is emphasized by the colour change of the fused vitrinite matrix from blue through yellowy-green to orange, from lower right to upper left, which is the Romax rank progression of the parent coals’ vitrinite, (shown by the yellow numbers). This change is also mirrored by the shapes of the AQ density profiles (coke reflectograms) which change from positive skewness to negative skewness, partly in response to the increase in parent coal rank. We believe the most accurate measure of a coke is its AQ reflectance, which for many commercial cokes lies within the range of 3.2 to 5.2. 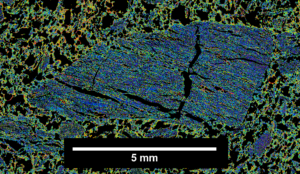 In the fabric of most cokes, the coarser Inertinite constituents of parent coals maintain their precarbonization shape – the so-called ‘unreactive semifusinite’, (aka unfused Inertinites), present as angular areas of blue, Low Anisotropy (LA) (Image 2 ); whereas the ‘reactive semifusinite’, (fusible Inertinites), display varying degrees of anisotropy, from yellows, to reds and crimson (Image 3). The strength of coke is improved by the higher anisotropy material, AQ’s >6. Coke is produced in tall slot ovens, which are heated from the sides, and where the melting coal surface, called ‘the plastic layer’, moves progressively to the centre. Coke is described as Expanding or Contracting, depending on whether the thickness of the plastic layer, in mm, measures more than the volume contraction, both measured by a Sapozhnikov plastometer. The Sapozhnikov Quotient (SQ), or Y/X, indicates the type of coke. is displayed by other Expanding cokes, and all are indicative of melting and growth under localized pressures. In contrast, Contracting coals (SQ<1), which are the dominant component in commercial coke blends, generally cause very low pressures of 5 kPa, or less. Both Sapozhnikov plastometry of coal and forensic petrography of coke identify dangerous coking coals, which are not restricted by rank, that is to say, we have examples of dangerous cokes from HV-MV- and LV-rank. Identification of Coke blend recipes. Coals of different ranks and provenances, with infinitely variable Inertinite types, are all mixed in commercial blends, leveraging best properties to produce optimum coke using the cheapest coals, in a recipe that presents high mechanical strength, but without a destructive wall pressure. Because of this, there are many recipes for blends. For example; anthracite with soft coking coal mixtures are found in several marketed Chinese cokes ; traditional HV/MV/LV mixtures dominate in North America; whilst additions of briquettes, of recycled breeze and of petroleum coke are found globally. In addition, because melting of coal is not synchronized – generally lower rank coals melt earlier than higher ranks, – many cokes record the melting/solidification history of coal where late-melting coal grains become entrapped in earlier-forming coke in textures called Encapsulites (Image 7). These textures are beneficial and show that destructive pressures have been suppressed, while individually they provide strength. In summary, coke blends are comprised of mixtures of fused vitrinites of various ranks, with angular Inertinites – the ‘Isotropic Inerts’ are generally mauve in our colour system. As well, inertinites of various levels of Anisotropy exhibit a wide selection of vivid colours from blues to a spectacular crimson, biaxial-negative variety. Stretching texture in a blend.